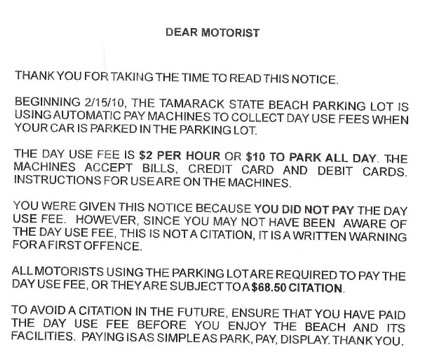 A Tamarack Parking Warning. . .
And from the looks of this warning, the media is right. Two more weeks of free parking at least. Gulp, gulp, gulp. . .
Just a little reminder from the Carlsbad Municipal Water District: thanks for being nice and conserving more than the eight percent that was requested. You know, the water has a long journey to get here and we should treat it well. 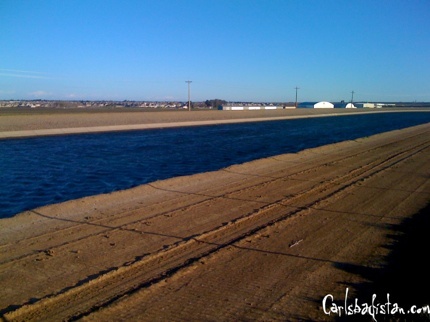 Carlsbad relies on water from the Colorado River and Northern California for 100 percent of its supply. California has faced severe water shortages due to a prolonged drought and legal restrictions on water pumped from Northern California. Recent local rain doesn’t help much because most of it runs off into the ocean and cannot be captured for future use. Thanks, Northern California. Come visit anytime. Barbara Henry explores the issues surrounding the City of Carlsbadistan’s employee pensions and how the recently announced mayorial candidate stand on the issues in a story in the North County Times. Councilman Keith Blackburn and Councilman Matt Hall —- have opposing viewpoints on the pension issue. Hall, whose candidacy is backed by the city’s current longtime mayor, has said the city needs to rethink its annual pension expenditures before they come to dominate the city’s budget. Blackburn, a former Carlsbad police officer expected to be endorsed by the city’s labor groups, has said the city needs to proceed cautiously and not be among the first in the state to try to restructure its system. Seems everyone agrees on the old cliché: if you want to keep good employees you need to pay them. It’s exactly how that is done that gets sticky. They just don’t give up. The public safety unions, fighting to protect their overly generous pensions and health benefits, have just suffered a savage defeat in Oceanside with the failure of the recall campaign against Councilman Jerry Kern. It was a classic union bait-and-switch to disguise the real issue: They riled up a group of senior citizens who felt Kern was rude and didn’t pay them the attention they deserved. They got them to launch a recall movement. And then they pumped huge amounts of money into the anti-Kern campaign in the hopes of getting a more sympathetic soul in council chambers —- a sympathetic soul who would turn a blind eye to the financial disaster these pensions and benefits pose to cities and states throughout our country. Common sense, you see, invariably wins out. And the unions know their days of looting government treasuries are numbered, in light of the recession and gaping budget deficits. 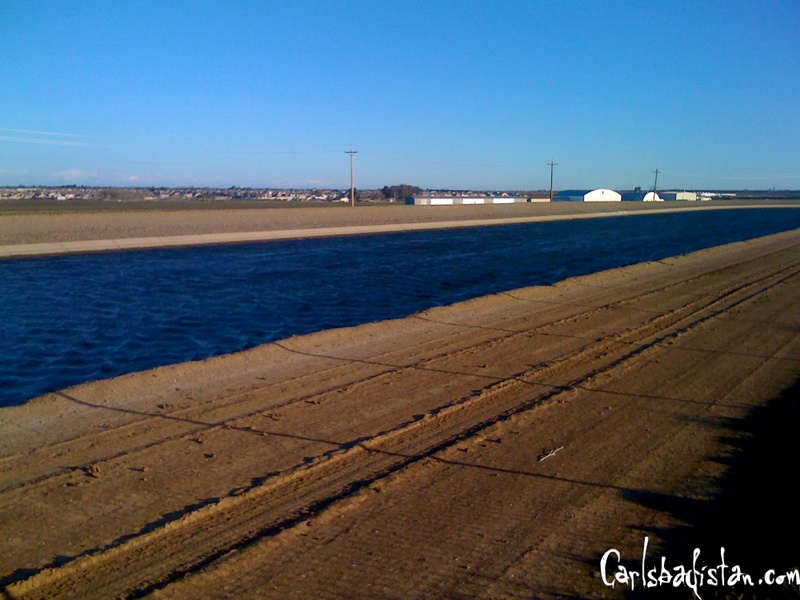 The Carlsbad Police department is reportedly investigating a fight that broke out on the beach near the Army & Navy Academy at approximately 5:15 PM on Tuesday, February 16, 2010 between “4 or 5” locals and “9 or 10” academy cadets, according to a story in the North County Times. Accounts of the melee vary depending on who is telling the story, but punches started landing after one teen pushed or hit another with a surfboard, Cain said. . . “We don’t know for sure who did what or who started it,” he said. . . Cain said that after the surfboard blow landed, several more teens piled on from both sides. Eventually a local lifeguard intervened and separated the two sides. One of the locals reportedly sustained a broken nose. Looks like the cadets stick together pretty well. Top- Michelle Barkowski, Camille Posard, Sydney Reed. Middle-Hailey Koopsen, Kelly DiMarco, Rylee Blair, Keara Verran, Lani Yamanaka. Front Row- Sara Steffy, Whitney Wilhardt, Brittany Smith. 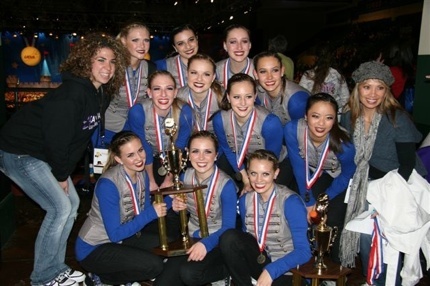 During this winter Olympic month Carlsbad Lancer Dancers have won a bronze medal of their own for their performance at the National Dance Team Championships at ESPN Wide World of Sports at Orlando Florida’s Disney World February 6-7, 2010. The 11 member varsity team flew out with two substitute coaches and 28 family members to cheer them on. . . Carlsbad’s Varsity Dance Team, The Lancer Dancers, placed 3rd overall in the nation, in the Hip Hop competition with a dance choreographed by Erik Saradpon. . . “When they called our team we were so excited! We so wanted to bring a medal home for Carlsbad.”, said Lani Yamanaka, Lancer Dancer. As a Bronze Medal winner, they were interviewed in the locker room by ESPN and their performance will be aired later this month on ESPN2. Congrats to all the girls. Nice work. We don’t usually watch Dance competitions on ESPN, but for this one we will make an exception. Click here and search for “Carlsbad” to watch all the performances. Is This The Reckless Lexus Of Garfield St? 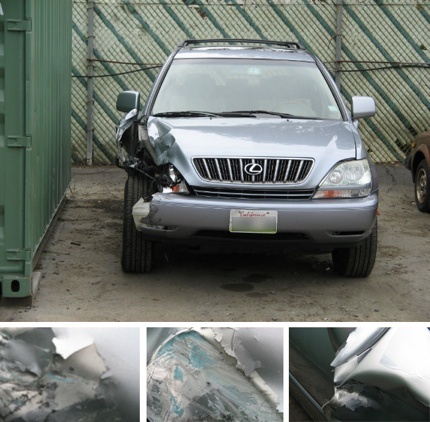 After some good old-fashioned social engineering, the victims of the February 4, 2010 Reckless Lexus hit and run on Garfield believe they have found the vehicle responsible for the collision. And they found it at a local Carlsbadistan body shop. After notifying the Carlsbad Police Department and providing officers with the matching paint and several missing car parts, the police were finally convinced enough by the victim’s detective work that they have reportedly impounded the vehicle as evidence in their criminal investigation. Another reminder of what is possible when people do a little work on their own. 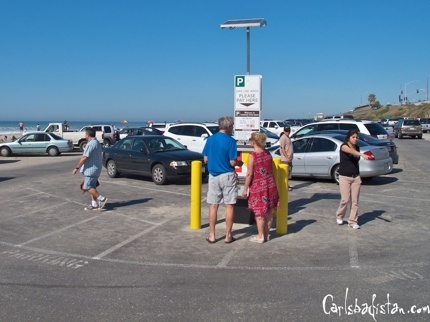 Today marks the beginning of week two of the California State Park systems charging for parking in the Tamarack Surf Beach parking lot. 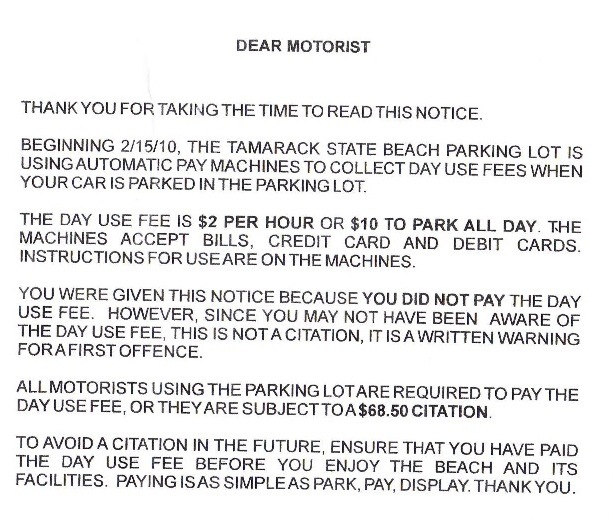 With “iron rangers” stationed at both the North and South ends of the parking lot more and more people are figuring out that free parking at Tamarack is definitely over. 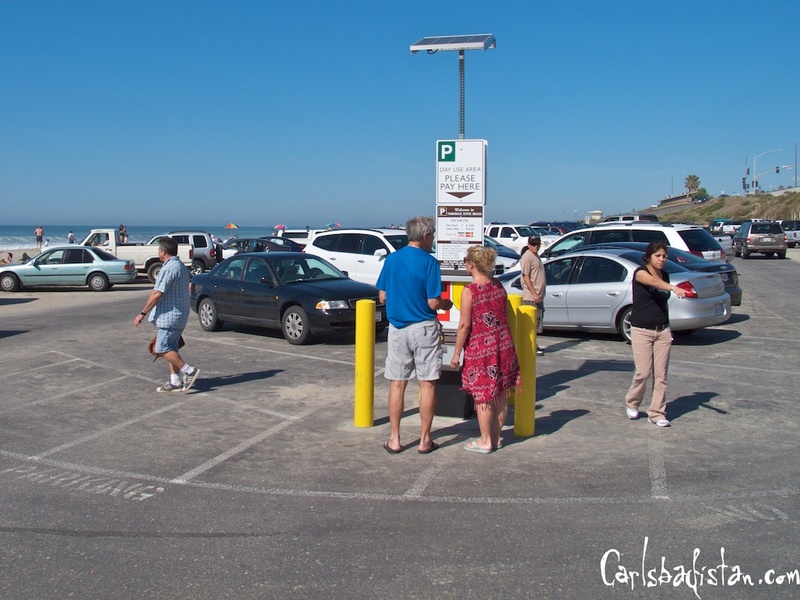 According to the City of Carlsbadistan the State will be giving beach visitors a one-month warning period after which they will begin issuing parking tickets to those who do not properly display their paid parking stub in their window. State Park Peace Officers and other state staff will distribute warnings and courtesy notices to visitors during the first month of the program. At the end of that period, vehicles not properly displaying a current pass or receipt will be issued a citation and fined up to $64. The fees to park in the lot are currently $2 a hour or $10 a day, but don’t worry about paying until at least March 14, 2010. Tell us how these fees will affect you by voting in our Carlsbadistan Poll in the right hand column just below the weather. 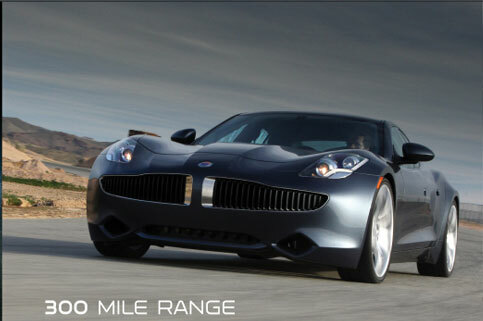 Carlsbadistan Village based advertising agency Lambesis has been named the agency of record for Irvine, California-based Fisker Automotive’s new Karma line of plug-in hybrid high performance automobiles according to a post on Green Car Advisor. The Karma is classes as an extended-range plug-in hybrid, meaning it combines a rechargeable battery pack and electric motor with an on-board gasoline-burning engine-generator that will continue producing juice for the electric motor after the initial battery charge is depleted. . . The creative types at Lambesis will earn their keep explaining all that in print and on-line ads and 15-second TV and radio commercials (presuming that’s where they’ll be placing Karma advertising material). Another reminder that there are some pretty big deals going down in Carlsbadistan. If you’ve meant to visit New Village Arts Theatre to catch the critically acclaimed play The Man Who, then this week is your last chance. The Man Who closes on Sunday February 28, 2010. The Man Who is inspired by, but is in no way a conventional stage adaptation of, The Man Who Mistook His Wife for a Hat, Oliver Sacks‘ best-selling collection of case histories about the neurologically impaired. Performed by a superb ensemble of four actors and one musician, this series of fables is an adventurous journey through the mind, as well as a demonstration of a very rare kind of dedicated theater craft. 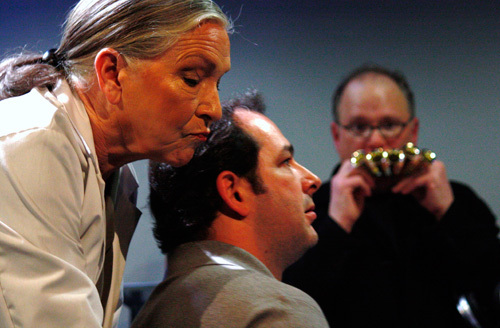 New Village Arts production of the play has been extremely well reviewed in The North County Times, SanDiego.com, and SD City Beat. The play run Thursday and Friday night at 8 PM, Saturday at 3 and 8 PM and Sunday at 2 PM. Click here to purchase tickets online.